Well I arrived a little after 4pm on Thursday into Geneva airport, at which point I suddenly panicked that I was supposed to be at Grenoble or another airport of equal distance to the Alps. Being the last minute, organiser that I am, I’d completely forgotten to get anyone’s phone numbers and so the only idea I had that I was going to be picked up was a faint memory of an email I’d read. (When you get to my age, and you’ve been brought up on things made in aluminium pots and pans, faint memories are better than no memory)! Half an hour of passive smoking (that’s right I’ve given up), and pacing up and down the arrival lounge, I spot a face I think I recognise. This could either become slightly embarrassing or get me out of the airport. I walked up slightly behind the person and called the name Sarah, she turns and smiles, thank god, I don’t have to pretend I was calling to someone else… Sarah is one of the other hotel managers, who has kindly come to pick me up. After a brief chat and a very brisk walk we arrive at the car. Now the journey was supposed to take around three hours, but we had appalling weather to contend with and the fact we had gone slightly wrong. This we found out when we arrived at the Mont Blanc tunnel, I was enjoying the scenery but I have a feeling Sarah was not so appreciative. After reversing out of the toll gate and turning I directed us across country to finally head across the Col de Galibier. Now I’m sure on a nice day this route would be spectacular, but in the dark, with fog and cloud surrounding us, not so much. I was more petrified of driving off a cliff than I’ve ever been. Friday, Sue picked me up at 8am to go and see two of our clubhotels, one in Alpe D’Huez the other in Les Duex Alps. After yesterday’s weather I thought we may have a nice day. It had started clear and blue when I went for my morning stroll around Serre Chevalier, although the temperature was very cold. Unfortunately for me the nice weather vanished and the rain returned, up in the high resorts reminded me of being on the Pennines or in the Northern Lakes, wet, miserable and bleak. 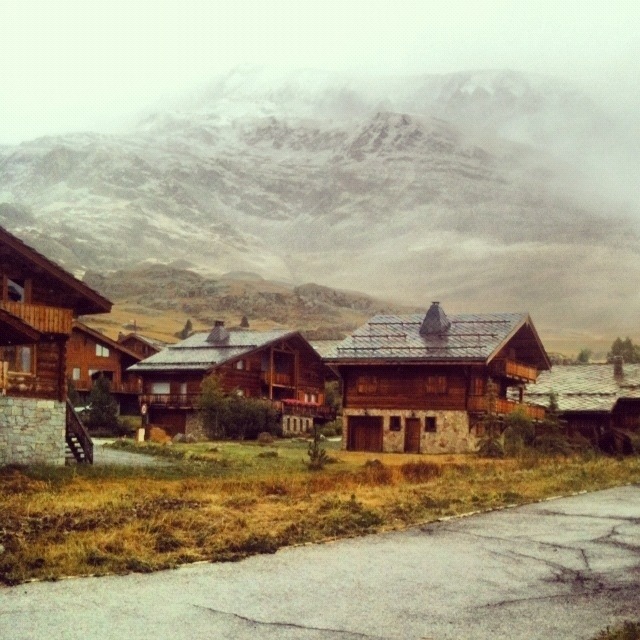 Then in an instant, the rain turned to snow and all around me the views of the high mountain peaks slowly turned white. It does indeed, just look up STG Recruitment, thanks for looking! Reblogged this on The Way to Santiago Blog.